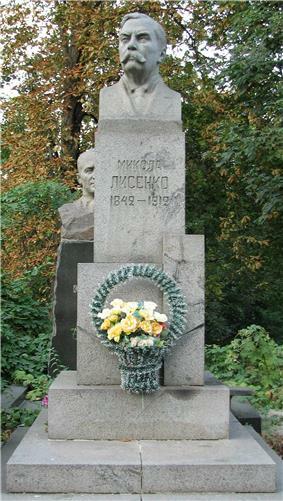 Mykola Lysenko's grave at Baikove Cemetery in Kiev. Mykola Vitaliyovych Lysenko (Ukrainian: Мико́ла Віта́лійович Ли́сенко, 22 March [O.S. 10 March] 1842 – 6 November [O.S. 24 October] 1912) was a Ukrainian composer, pianist, conductor and ethnomusicologist. Lysenko was born in Hrynky, Kremenchuk county, Poltava Governorate, the son of Vitaliy Romanovych Lysenko (Ukrainian: Віталій Романович Лисенко). From childhood he became very interested in the folksongs of Ukrainian peasants and by the poetry of Taras Shevchenko. When Shevchenko's body was brought to Ukraine after his death in 1861, Lysenko was a pallbearer. During his time at Kiev University, Lysenko collected and arranged Ukrainian folksongs, which were published in seven volumes. One of his principal sources was the kobzar Ostap Veresai (after whom Lysenko later named his son). Lysenko was initially a student of Biology at the Kharkiv University, studying music privately. On a scholarship which he won from the Russian Music Society he pursued further professional music studies at the Leipzig Conservatory. It is there that he understood the importance of collecting, developing and creating Ukrainian music rather than duplicating the work of Western classical composers. On his return to Kiev he continued to create Ukrainian themed compositions. His Ukrainophilic approach to composition was not supported by the Russian Imperial Music Society which promoted a Great Russian cultural presence in Ukraine. As a result Lysenko severed his relationship with them, never to compose any music set to the Russian language, nor allow any translations of his works into the Russian language. The Ems Ukaz, which banned use of Ukrainian language in print, was one of the obstacles for Lysenko; he had to publish some of his scores abroad, while performances of his music had to be authorized by the imperial censor. In order to improve his orchestration and composition skills the young Lysenko traveled to St. Petersburg where he took orchestration lessons from Nikolay Rimsky-Korsakov in the mid-1870s, but his fervent Ukrainian national position and disdain for Great Russian autocracy impeded his career. He supported the 1905 revolution and was in jail briefly in 1907. In 1908, he was the head of the Ukrainian Club, an association of Ukrainian national public figures in Kiev. For his opera libretti Lysenko insisted on using only the Ukrainian language. Tchaikovsky was impressed by Lysenko's Taras Bulba and wanted to stage the work in Moscow, but Lysenko's insistence on it being performed in the Ukrainian language, not Russian, prevented the performance from taking place in Moscow. In his later years, Lysenko raised funds to open a Ukrainian School of Music. His death was widely mourned throughout Ukraine. Lysenko's daughter Mariana followed her father's footsteps as a pianist, and his son Ostap also taught music in Kiev. Lysenko composed 133 art songs many of which on lyrics by Taras Shevchenko as well as Lesia Ukrainka, Ivan Franko, Heinrich Heine, Oleksandr Oles, Adam Mickiewicz and others. He also arranged approximately 500 folk songs for voice and piano, choir and piano, or choir a cappella. Lysenko's larger works for piano include Ukrainian Suite in Form of Ancient Dances, two rhapsodies (the second, Dumka-shumka is one of his most-known works), Heroic scherzo and Sonata in A minor. He also wrote dozens of smaller works like nocturnes, polonaises, songs without words, program pieces. Some of his piano works show influence of Frederic Chopin's style. Lysenko's chamber music includes a string quartet, a trio for two violins and viola, and a number of works for violin and piano. Lysenko wrote a number of operatic works, including Natalka Poltavka, Utoplena (The Drowned Maiden, after Gogol's May Night) and Taras Bulba. Lysenko made the first musical-ethnographic studies of the blind kobzar Ostap Veresai which he published in 1873-4; they are still exemplary. In this work Lysenko demonstrated the way in which Ukrainian melodic material differs from Russian analogues by its unique use and approach to chromaticism (something that was censored out in Soviet editions of his articles). Lysenko continued to research and transcribe the repertoire of other kobzars from other regions such as organology and one of the first organologist in the Russian Empire. ^ Dr. Dagmara Turchyn. "Mykola Lysenko — His Life (1842-1912)". (Old) Ukrainian Art Song Project Website. Archived from the original on 2011-02-08. ^ "Mykola Lysenko (1842–1912)". Ukrainian Art Song Project. Retrieved 2015-06-09. The World of Mykola Lysenko: Ethnic Identity, Music, and Politics in Nineteenth-Century Ukraine. Taras Filenko, Tamara Bulat. Ukraine Millennium Foundation (Canada). 2001. Hardcover. 434 pages. ISBN 966-530-045-8.